The Patriots And Seahawks Are The Best. This Could Be The Worst Super Bowl Ever. People pass Roman numerals for Super Bowl XLIX on Wednesday in Phoenix. The University of Phoenix Stadium on Thursday in Glendale, Arizona. So what if the pregame story lines have been asinine and absurd? On Sunday, the New England Patriots and Seattle Seahawks will be among the most talented teams to take the field in the Super Bowl. 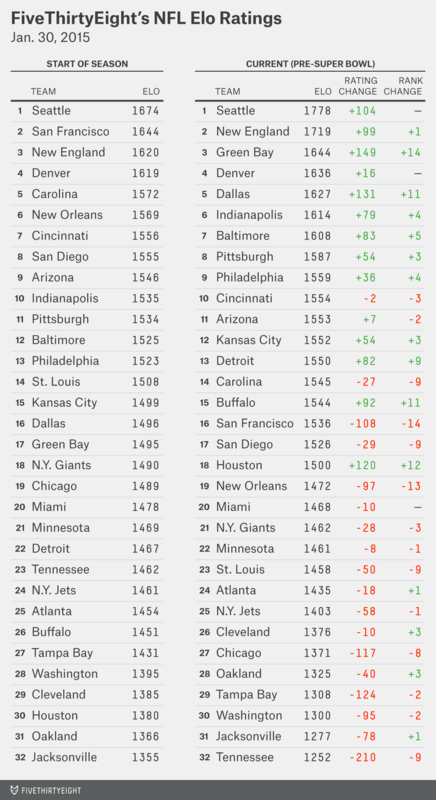 According to FiveThirtyEight’s NFL Elo ratings, this year’s Seahawks are the fifth-best team to participate in a Super Bowl since the AFC-NFC merger. And the Patriots aren’t far behind. The average Elo rating of the teams this year is the second-best in a Super Bowl since that merger, trailing only Super Bowl XIII when the Dallas Cowboys played the Pittsburgh Steelers. Elo’s lofty ranking of the game might seem surprising given that the Seahawks and Patriots each went 12-4 in the regular season, excellent but hardly extraordinary records. Those records probably underestimates their strength, however. Both teams played relatively tough schedules, and both finished the season stronger than they started it — notwithstanding the Patriots’ throwaway loss in Week 17, when they rested their stars against the Buffalo Bills. But it’s not only that the Seahawks and Patriots are strong teams: They’re just about evenly matched. The Vegas line opened as a pick ’em, and most sports books have the Patriots as mere one-point favorites. 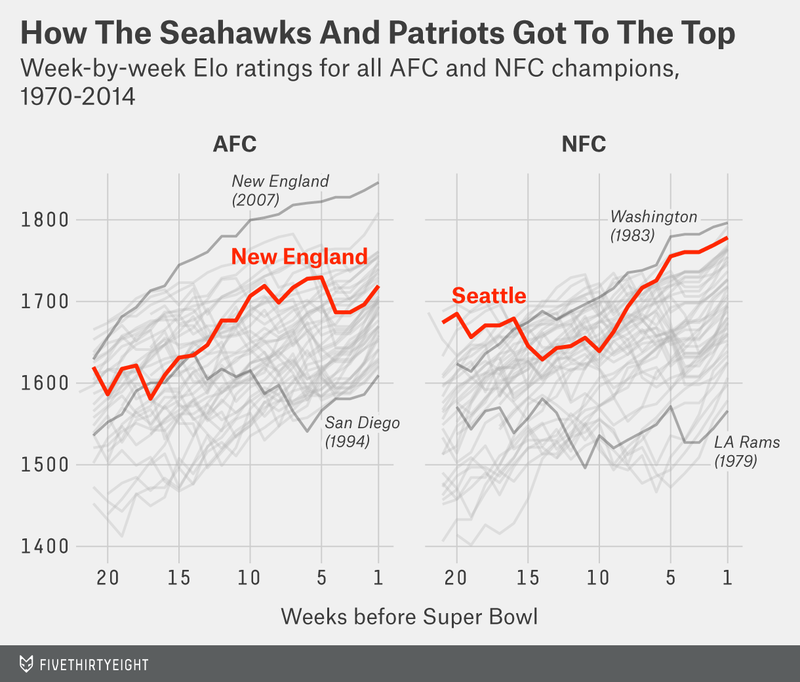 Elo, which loves the Seahawks, differs slightly here: It has Seattle as 2.5-point favorites. But that’s partly because the system, in its simplicity, punished the Patriots for their meaningless Week 17 loss against Buffalo. Without that game, the Patriots’ Elo rating would be 1756, which would make Seattle only one-point favorites and which would vault this matchup ahead of Super Bowl XIII into the top slot of all time. The top-left quadrant represents games in which the teams were fairly evenly matched but not particularly great — like the Super Bowl we had two seasons ago between the San Francisco 49ers and Baltimore Ravens. The bottom-right quadrant is for Super Bowls when the average Elo rating was high but because of one spectacular team, like when the undefeated 2007 Patriots played (and lost to) the New York Giants. But here’s the catch: Those great-seeming matchups didn’t translate into great Super Bowls. 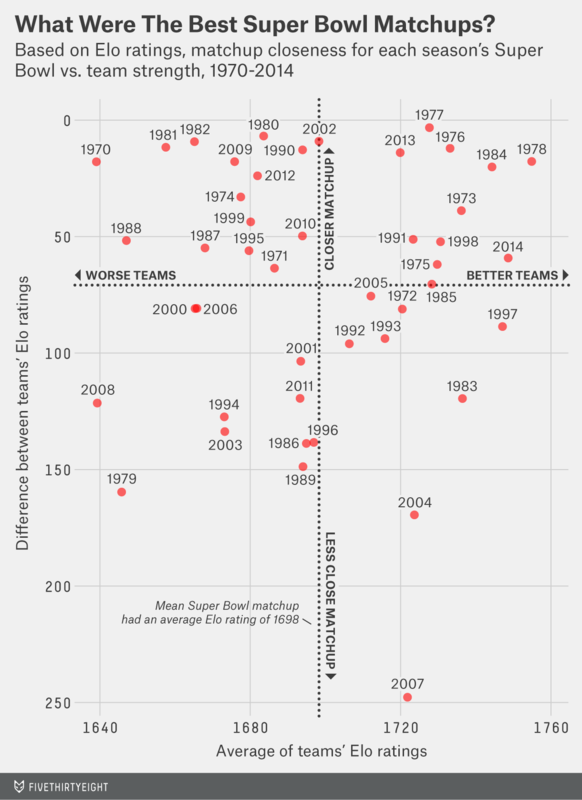 Below, we’ve ranked the 48 prior Super Bowls based on a version of the Excitement Index, which measures the quality of a game based on how much win probability changes over the course of it. This season’s NFC Championship would, obviously, qualify as an extraordinarily exciting game — the Seahawks’ win probability shifted from near zero to very likely late in the fourth quarter, and then back to basically 50-50 after the Packers kicked a field goal to send the game to overtime, and then up to 100 percent once the Seahawks won in OT. By contrast, the AFC Championship — the Patriots were favored, pulled ahead early and never looked back — would have a low Excitement Index. The Excitement Index is not perfect — compared with how we would rank the games intuitively, it seems to give too little credit to unlikely fourth-quarter comebacks, for instance. But it does a reasonable job of ranking the Super Bowls. The top Super Bowl of all time, according to the Excitement Index, was Super Bowl XXIII, played after the 1988 regular season between the 49ers and Cincinnati Bengals. Most of the other obvious candidates — like Wide Right and the Giants’ upset of the Patriots in Super Bowl XLII — also rank highly. The win probability data we’re using is from Pro-Football-Reference.com, and accounts for the point spread, so a game that turns out to be lopsided between teams that looked evenly matched beforehand (like last year’s Super Bowl or Super Bowl XVIII) will get a bit of credit. A game in which a heavy favorite romps to victory (like Super Bowl XXIX, when the 49ers, as 19-point (!) favorites against the San Diego Chargers, were ahead 14-0 after four minutes of play) will get almost none. But the hope is for a Super Bowl that stays tight from wire to wire with plenty of drama in between. And if you’re looking at those matchups that looked best on paper going in — those from the top-right quadrant of the chart — you won’t find many that turned into great games. There’s one very encouraging precedent. The aforementioned Super Bowl XIII, played after the 1978 regular season, had a lot of parallels to this one. The Cowboys, like this year’s Seahawks, were a 12-4 team coming off a Super Bowl championship. The Steelers, like this year’s Patriots, were an aging dynasty hoping for one more ring. (As it turns out, they’d win two more.) The Steelers won 35-31, and the outcome might have different if not for a dropped touchdown catch by Cowboys tight end Jackie Smith. Super Bowl XIII ranks very well in the Excitement Index and even higher on subjective lists of the best Super Bowls, one of which has it as the best game ever. There’s last year’s Seahawks-Denver Broncos debacle. There’s Super Bowl XIX (played after the 1984 regular season). What was supposed to be a spectacular matchup between Joe Montana and Dan Marino turned into a rout as the 49ers clobbered the Miami Dolphins 38-16. There’s Super Bowl XII (1977), which never really became competitive; the Cowboys’ win probability was up to 95 percent by the middle of the second quarter and they coasted to a 27-10 win over the Broncos. There’s Super Bowl VIII (1973), one of several poor Super Bowls involving the Minnesota Vikings. The Vikings didn’t score until the fourth quarter and lost to the Dolphins 24-7. There’s another Vikings stinker from a few years later, Super Bowl XI, when they lost to the Oakland Raiders 32-14. There’s Super Bowl XXVI (1991), when the Bills were down 24-0 to the Washington Redskins before scoring a few “junk time” touchdowns and losing 37-24. There’s Super Bowl XXXIII (1998), won by John Elway’s Broncos over the Atlanta Falcons, which proved anti-climactic after the Falcons upset the 15-1 Vikings in the NFC Championship. We wouldn’t say to expect a bad Super Bowl on Sunday. This is a noisy data set. It’s probably a fluke that the games that looked best on paper turned out to be among the worst on the field. But that’s the point: Any one game won’t tell you all that much, and as we’ve pointed out before, an NFL matchup that looks just about even beforehand is only slightly more likely than average to result in a great game. This could be a super Super Bowl — but it could just as easily turn out to be a dud, in which case Deflate-gate and Katy Perry will burn an SEO-optimized hole into our collective memories.